Who Causes the New Birth? We’ve been looking at John 3 and what Jesus said to Nicodemus about being “born again” or “born from above.” Now let’s consider who causes this to happen. Do you cause your own spiritual birth… or does God? Scripture teaches that only God can cause anyone to be born again and that we can’t cause it, or control it, or manipulate it in any way. However, when God does enable us to be born again and has given us new life by His Spirit, then we will believe the truth about Christ revealed in Scripture; we will come to Him as He is lifted up in the gospel presentation. We will love Him as our Lord and Savior and Treasure of infinite worth; we will love our brothers and sisters in Christ with sacrificial love; and we will yearn to follow Him through obedience to His Word all the days of our life. The new birth – being born again – enables a person to respond to Jesus with life and obedience and joy… instead of spiritual death and disinterest and disgust. Would Jesus say the same thing about your spiritual status based on what we see here in the text? The desire to come to Jesus for salvation is a necessary part of His enablement. We see this in Nicodemus’ desire to come. Believe that His death on the cross was the full and final payment for all of your sins and there’s nothing you can ever do to add anything to His meritorious work on your behalf. Entrust yourself to Him… and follow Him from this day onward. This is not a verse about baptism, but about the spiritual cleansing spoken of in the OT (Ezekiel 36:24-27) which was surprisingly missed by Nicodemus! We’ll continue with this in our next blog. Being “born again” is a phrase coined by Jesus Himself. It literally means “born from above.” This is another way of expressing spiritual life through the new birth. What happens in the new birth is not about getting another religion – or even a better religion; it’s about getting a new life. What happens in the new birth is not about merely recognizing and affirming the supernatural power of Jesus, but experiencing that supernatural power personally in yourself. In verse 3, Jesus tells Nicodemus and us that our eternal lives depend on being born again: “Truly, truly, I say to you, unless one is born again he cannot see the kingdom of God.” The word “cannot” refers to our spiritual inability. Being born again isn’t optional or superficial. It isn’t something you just “add-on” to your existing religious practices. As one author says, the new birth is not like cosmetics that morticians use to make corpses look more life-like. The new birth is the creation of authentic spiritual life, not the imitation of life. Religious zeal can imitate spiritual life. High moral standards can imitate spiritual life. Good works and virtuous integrity can imitate spiritual life… but compared to true spiritual life… all of these are like the morticians’ cosmetics on a corpse. You can do all of those things and still be absolutely spiritually dead and lost! That’s why you must be born again. In the rest of John chapter 3 we’re going to learn from Jesus what the new life is and how God brings it about through the miracle of regeneration. 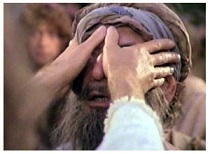 In a spiritual sense, Nicodemus was blind. Without being born again, he could not see the kingdom of God (v. 3). But even though Jesus said he was blind in a spiritual sense (blind to God and His truth), Nicodemus could still “see” many important things about Jesus. This observation helps us to understand that even the spiritually blind can “see” many important truths about Jesus while still being dead to God. They have a witness that makes them culpable, but they reject it apart from regeneration. 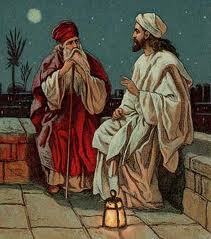 Nicodemus was at the top of the religious council in Israel. In verse 1, we learn that he was a Pharisee and a member of the Sanhedrin (“a ruler of the Jews”). This means he was well educated and highly respected among the Jewish people. He was like the distinguished professor emeritus, the religious doctor emeritus of Israel. He was a religious leader, he was a ruler, and considered the teacher in Israel (v. 10)… and Jesus is about to show him that religious rank and prestige are worthless when it comes to knowing God and having spiritual life in Christ. Even as an unbeliever, Nicodemus could recognize the supernatural power of Jesus and could even affirm His connection to God as evidenced by those signs. But rather than congratulating Nicodemus, Jesus goes right to the heart of the matter… and He says something that doesn’t seem to match what Nicodemus just acknowledged. We learn in Christ’s answer that Jesus isn’t merely responding to what Nicodemus says, he’s responding to the private thoughts in Nicodemus’ head! This is another evidence of the deity of Christ. He can read our thoughts. He knows our hearts. That’s why it seems almost like a non-sequitur when Jesus responds to a statement about coming from God and doing signs with a statement about the necessity of being born again in order to “see” the kingdom of God. Jesus was answering the unspoken thoughts that were behind the ultimate reason for coming to Him. So there are many astute and correct things that even the spiritually blind can see about Jesus… but they still must be born again. In the next blog, we’ll look at this phrase Jesus used called “born again.” What does it mean to be born again… and how does this differ from being religious? We can learn a lot from listening to interviews; especially when Jesus is the Moderator. Jesus interviewed various people from diverse social, religious, and ethnic strata – and His purpose was to demonstrate one common theme: they all need spiritual life and salvation from Him. John chapter 3 is one of the clearest passages on what it means to be born again. The only way we can be ready to face today is by being ready to face eternity. Apart from faith in Christ, a person is spiritually dead and all the religious activity in the world cannot overcome that spiritual death. Only faith in Christ, which is God’s free gift, can raise the spiritually dead to new life in Christ. When a person has this faith, they see and taste and believe in a spiritual sense. This is evidence of new life from God. One of the first lessons we can learn from the example of Nicodemus is that it’s possible to be very religious and still be very lost and spiritually dead to Christ. John demonstrates this in chapter 3. Nicodemus has impeccable religious credentials. What about you? Do you consider yourself a religious person? Are you proud of your religious affiliation… of your denomination… your church… your virtue? Do you trust in this for salvation? In the next several blog entries, I want to explore the way in which Jesus probes beyond the religious exterior of Nicodemus to reveal this very religious man’s need for true salvation. And by so doing, we will see our own daily need for Christ as well. In this final installment on fighting our tendency to worry with a correct view of prayer, we will continue our look at Philippians 4:6-7 and focus on the effect of thankful prayer. The effect of thankful prayer is the surpassing, protecting peace of God. That’s the message of verse 7. Notice how the word “guard” is used here. This was the word used of the way in which garrisons would guard the gates of a city, not from the outside, but from the inside. The effect? This interior guard can protect against those things that go out from us, as well as those things that come against us from the outside. In like manner, God must guard our heart from the inside by the indwelling power of His Holy Spirit. It is God’s peace (or more accurately, that peace produced by God) that guards us. He guards our hearts—that protects our disposition; and He guards our minds—that protects our thought life. We need this divine protection against the assaults of the enemy within and without. In these words Paul exhorts the Philippians, to cast all their care upon the Lord. For we are not made of iron﻿, so as not to be shaken by temptations. But this is our consolation, this is our solace —to deposit, or (to speak with greater propriety) to disburden in the bosom of God everything that harasses us. The word for understanding here is literally the mind; the processes of logical thought. But God’s peace surpasses even this! It’s a non-logical (not il-logical!) peace which is calm even in the face of tremendous adversity. Here is a peace that, quite frankly, doesn’t make any sense to the logical mind. It surpasses all understanding. Several years ago I was on a week-long trip to Arizona for some meetings. Part of that trip included a chartered flight over the Grand Canyon in a 727 jet. As we flew into the mouth of the canyon, an air current caused our plane to suddenly lose altitude. We were plummeting, not nose-first, just flat down into the canyon. At that moment there was no time for a logical exercise of peace-making. Yet I felt remarkably calm and filled with an unspeakable peace. Not that I would live, but that whether I lived or died, it would be alright. Well, the plane swept back up on the next air current and the color returned to the faces of the nauseated flight attendants. When you see that—you know it’s going to be okay. But what was this peace I felt? I can tell you this, it wasn’t anything that I could grab hold of in that moment of alarm. The crisis was too sudden for that. Fear streaked through that airplane like lightening through a metal pipe. The only way I can explain it is as a peace that instantly grabbed hold of me… and enveloped me. It was not a logical peace, it surpassed all understanding. That’s the first thing we’re to notice about this peace of God. But we need to see something else. Second, this peace of God is a protecting peace. It will guard your hearts and minds through Christ Jesus. The heart and the mind… these are the venues of our being. It’s not enough to guard just one or the other. If the enemy gets a foothold in either of these prime territories, we can be easily defeated with prayerless anxiety. God’s peace protects the heart and the mind. You remember the story in Mark chapter 4. While the anxious disciples were panicked by the storm, Jesus, being aware of the Father’s protecting peace—slept away in the stern. What a picture of our situation in times of crisis! Because only God knows the full scope of our mortal conflict, only He can adequately guard our hearts and minds against the dark forces of the hidden foe. The child of God who takes anxiety and turns it into a passionate prayer to God will experience this surpassing, protecting peace of God. This is the benefit of one who prays for everything with both prayer and supplication, making your requests known to God. The one who prays for everything may experience God’s peace in everything. The text leaves no room for doubt. He doesn’t say the peace of God may guard (as if there were some doubt)… but this peace of God most certainly will guard your hearts and minds… through Christ Jesus. Note the means of this guarantee. This inerrant promise is stamped with the name and imprimatur of God’s own dear Son. It cannot fail! But will you fail to ask? The only prayer God cannot answer is the one you refuse to pray. The only request God cannot grant is the one you refuse to ask. He says ask… pray… request. Every one of us has a mental worry list. The list may change from day to day. But what God says to each of us this morning is to take that list—scratch out the heading “worry list” and change it to prayer requests—then something amazing will begin to happen. The peace of God, which surpasses all understanding, will guard your hearts and minds through Christ Jesus.